Andy Peaks felt AFC Rushden & Diamonds were good value for their 2-0 success over Halesowen Town last night (Tuesday). Second-half goals from Ben Farrell and Tom Lorraine proved to be enough to wrap up all three points and Diamonds saw the game out, despite having Ben Diamond sent-off for two bookable offences. 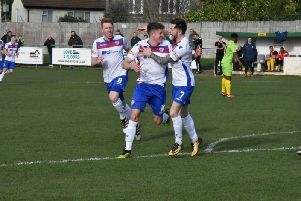 The win sent Peaks’ team up to a season-high position of third in the Evo-Stik League South Premier Division Central. And the manager was pleased with what he saw as his team followed up the 1-1 draw at Lowestoft Town at the weekend in perfect fashion. “It was a good win for us and an important one because we have come away from the last two games with four points after the disappointment of losing at Banbury,” Peaks said. “I thought we thoroughly deserved the win. “We controlled the first half and we passed the ball really well but we came in knowing that Halesowen probably had the best chance of the game. “So that was something to think about but I just wanted us to keep doing the same things. “We got a bit of luck with the first goal with the deflection but that luck is something I don’t think we have had on our side recently. The win looks to have come at a cost, however, with Diamonds facing an injury crisis, particularly in the defensive area. Skipper Liam Dolman missed the game due to a calf injury, Jack Westbrook is currently suspended and Jack Ashton was forced off with a suspected hamstring problem in the second half at Hayden Road. Peaks recalled Blaize Punter for the game and now believes he will have to step up his search for a new centre-half ahead of Saturday’s clash at fifth-placed Leiston. “Liam is still very sore and he is struggling for the weekend,” he added. “Jack Westbrook is out and now we have Jack Ashton struggling as well. “We have a threadbare squad and everyone is pulling their weight in difficult circumstances, which is really pleasing. “But I need to have a look at it and I could really do with getting a centre-half in.